These are a great thing to have in your bag. I wish I would have bought a couple more. Non ho avuto ancora modo di adoperarsi. Credo che sia tanto utile quanto è semplice. Small item that comes in handy when needed. I added a reinforced hole to my card and use a key ring to attach it to the lanyard of my timer so I always know where to find it. Excellent product, a must for everybody's range bag. Real cheap and very handy. Takes the guesswork out of scoring a target. Super Produkt. Kann man immer brauchen... War eine Gratisbeilage von DAA. Vielen Dank! Excellent Product. It would be of great assistance if and when needed. 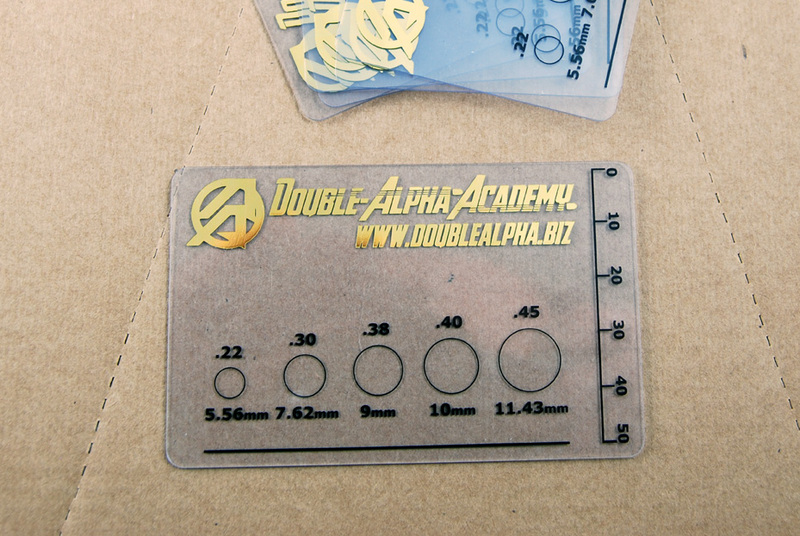 Made of sturdy 0.75mm thick hard transparent plastic, these overlay gauges are a “must have item” in every range bag! They are the size of standard credit cards and so fit easily into any wallet or pocket. Include precisely drawn caliber circles and a handy 50mm side ruler for measuring gear’s distance from the body.